In the 18th century, George Bähr designed the characteristic domed structure of the Frauenkirche, which had shaped Dresden’s townscape over the period of two hundred years. The church, however, was destroyed as a result of the bombings in February 1945 and its ruins had remained as a memorial in the heart of Dresden for more than 40 years. It was not until 1994 that Dresden began to rebuild the church based on the original design. When the project was finally finished on December 30th 2005, the Church of Our Lady was re-ordained in a festive ceremony. The Hofkirche is a cathedral belonging to the Roman Catholic Diocese of Dresden-Meißen as well as a parish church. When Augustus the Strong converted to catholicism to become the Polish king, he initiated the construction of the Hofkirche. However, the project was not realised until his son assigned the contract to the Italian architect Gaetano Chiaveri. The roof, interior vault and outer walls were subject to heavy damage and collapsed as a result of the bombings in February 1945. The restoration process of the catholic church stretched until 1965, however, the marks of the bombings are still visible to this day. Dresden Zwinger is considered to be Dresden’s landmark. 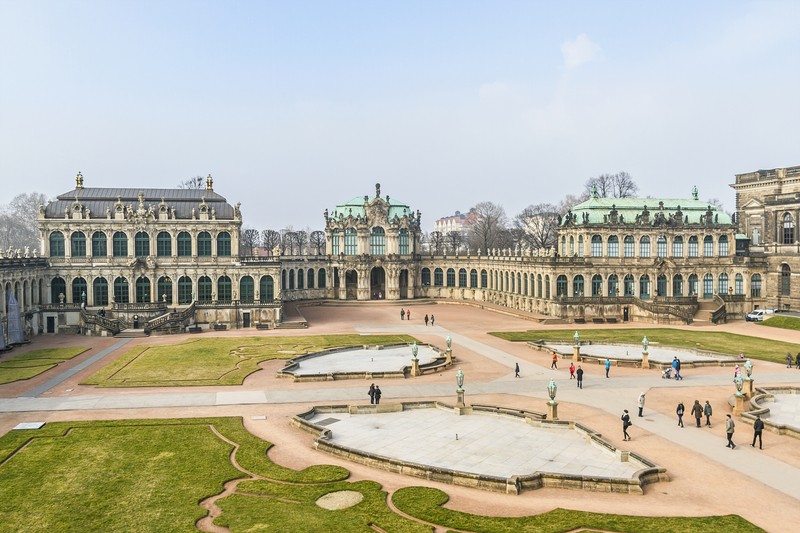 Originally built as an orangery and festival arena for the Dresden Court in the 18th century, the architect Gottfried Semper enclosed the Zwinger by building the Semper Gallery on the side facing towards the Elbe. Today, the Zwinger hosts a porcelain collection, the Gemäldegalerie Alte Meister (Old Masters Picture Gallery) and the Mathematisch-Physikalischer Salon (Royal Cabinet of Mathematical and Physical Instruments). The spacious complex with its lawns, fountains and galleries invites visitors to amble along, no matter what season. FRAUENKIRCHE DRESDEN The Church of Our Ladys can look back on a thousand year-old history. HOFKIRCHE The catholic Hofkirche has been consecrated to the Holy Trinity. ZWINGER The Zwinger with its spacious premises. Brühl’s terrace, also referred to as “Europe’s balcony”, was built in the 16th century as part of a fortress. Later, Count Heinrich von Brühl had the so-called “Brühlschen Herrlichkeiten”, which include the Palais Brühl, the Brühl Garden (Brühlscher Garten) and the Belvedere, built on the location. As a result, the fortress had lost its military purpose. Furthermore, in 1708, the alchemist Johann Friedrich Böttger worked out how to produce the first European hard porcelain in 1708 in the underground vaults of Brühl’s Terrace. As of 1814, Brühl’s terrace was also open to the public. Today, it also houses various cafés and restaurants, which invite visitors to stay and marvel at the surrounding sights: from here, visitors have a superb view of the river Elbe, Dresden Cathedral (Hofkirche) or the Semperoper opera house. 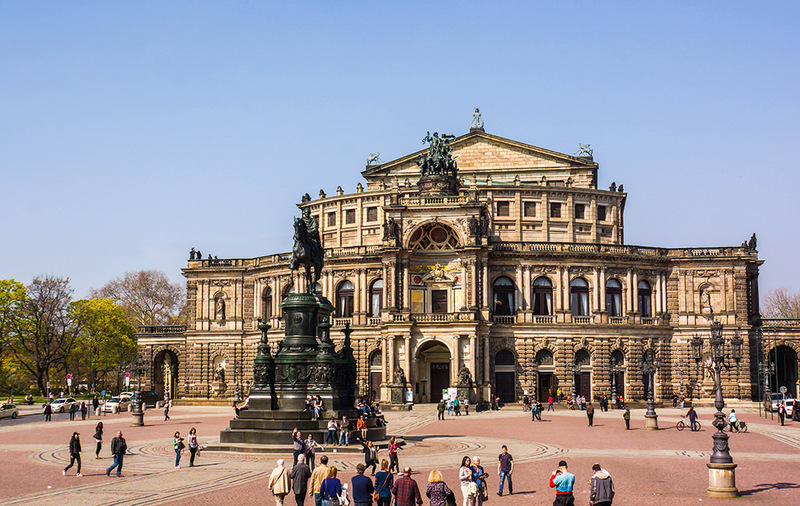 Dresden Semperoper is probably the most famous opera house in Germany and was named after its architect Gottfried Semper. The building, as it is today, is already the third construction: Between 1838 and 1841, Gottfried Semper built a new royal court theatre in Dresden, which was completely destroyed as a result of a fire in 1869. Subsequently, the construction of a new royal court theatre, also designed by Semper, was initiated in 1871. However, the reconstructed opera house sustained severe damage from the February 1945 bombings. After a long reconstruction period, almost exactly 40 years after it had been destroyed, the new Semperoper was finally ordained in a festive ceremony on 13th February 1985. Today, it shows performances from the opera, state chapel, ballet and the young scene.